After two days down in Fort Myers, here is a compilation of scouting notes from workouts and two games. The first game scouted was between the Low A Red Sox and the Low A Twins and the second an intrasquad scrimmage between prospects who are slated to open in either the DSL, GCL, or Lowell. - Right-hander Heri Quevedo started the Low A game against Minnesota, working four innings. His command was shaky at the start, and he left a few fastballs up in the zone that the Twins hitters were able to handle. His fastball sat 92-94 mph, topping out at 95 mph and as he got deeper into the outing, he was able to command the pitch more effectively, working down in the zone. Quevedo has some feel for secondary pitches, mixing in a slider, changeup, and curveball at various points. His slider was inconsistent, as he had trouble finding his arm slot. This caused him to come around the ball and the pitch to flatten. When he got on top of the pitch, however it showed deep 10-4 break. Quevedo’s curveball was also inconsistent, coming in between 77-79 mph. 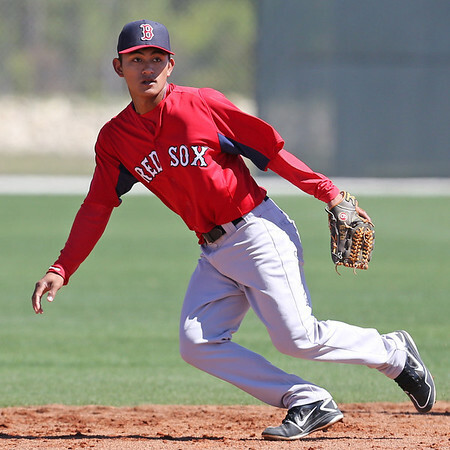 - Tzu-Wei Lin (pictured) showed off an advanced approach in the intrasquad game, drawing three walks, mostly against pitchers slated to start in the upper minors. Only one of these walks was on four pitches, and in the rest, he was able to work the count and fight back even after falling behind. Lin also added a single, showing off plus speed getting down the line to beat out a groundball to the shortstop. Defensively, Lin looked the part; fielding his position with ease and showing off a plus-to-better arm, range up the middle, and soft hands. - Manuel Margot has continued to build upon his strong 2012 campaign, showing off the tools across the board both in workouts and game action. Margot is extremely fluid with his actions at the plate, in the field, and on the bases. He only had one hit during the game, but he reached base two other times, both because of his speed. His hit came on a fastball away, which he waited on and using a fluid, short swing, lined to right field. Hustling right out of the box, he hit another gear as he rounded first base and glided into second base on a play that for most hitters would only be a single. In the field, Margot displayed great instincts, getting a quick jump on a sinking line drive in the right-center field gap and tracking it down. - Wendell Rijo is still recovering from July 2012 ACL surgery and only recently started participating in intrasquad games. His movement in the field still seems restricted and he is tentative at times when going after groundballs to his right. Regardless, he still has smooth actions and excellent hands especially when dealing with short hops. At the plate, Rijo has an open stance and his hands high to start, but he drops them and closes his stance during his load to end in a good hitting position. He had some trouble picking up breaking pitches today and his swing gets too long when he comes around the ball rather than pulling his hands in and hitting inside the ball. - Cleuluis Rondon has stood out the first two days, mostly because of his bat. Rondon is bigger than the other middle infield prospects discussed in this piece and more physically developed. His hands work well, generating good bat speed and he does a good job controlling the head of the bat to work to all fields, especially when batting left-handed. In his first at-bat of the game, this was on display as he put a smooth, easy swing on a fastball away lining it for a single between the third baseman and shortstop. When batting right-handed, Rondon’s bat tends to drag and he isn’t as quick to the ball. During batting practice, however, he has shown some pop from the right side, opening his hips and creating leverage to drive the ball. - During his time with Lowell last season, Williams Jerez struggled with fastballs on the inner-half of the plate and he was defensive with his swings. It is clear that he has been working on this, as during batting practice he is consistently reminding himself to keep his hand inside the ball and he has done a better job attacking pitches. He has always had plus bat speed and a swing that produces leverage to drive the ball, but it didn’t translate to games. In batting practice, he is producing that leverage, staying inside the ball and showing power to right field. In game action, however it isn’t translating yet as his approach is still extremely rough and he struggles to pick up secondary offerings. - Raymel Flores has tools, showing off plus speed on a groundout and quick hands and nice actions at shortstop during workouts. At the plate, Flores uses his hands well, but his bat drags especially against higher velocity. Part of this is caused by his size, as he is small in stature and needs to add a decent amount of weight to fill out his frame. - Alixon Suarez size is noticeable on the field especially when up against other 17 and 18 year olds. He is raw with his pitch recognition skills and his bat drags at times. When he squares the ball up, however, he can generate backspin and the ball carries off his bat. He is more advanced defensively, looking comfortable blocking balls in the dirt and moving laterally.